Full, luscious hair is important to both men and women. Unfortunately, genetics, certain health conditions, environmental factors and the natural aging process rob many individuals of this. According to the American Academy of Dermatology, an estimated 80 million men and women suffer from some sort of hair loss. If you are among them, The Plastic Surgery Center can help. We are pleased to offer NeoGraft Automated Hair Transplantation, an advanced hair restoration system that delivers noticeable results with little to no pain or downtime. NeoGraft and The Plastic Surgery Center have helped many individuals enjoy the confidence that comes from having a full head of natural-looking hair. NeoGraft uses the follicular unit extraction (FUE) method of hair transplantation. The FUE method removes individual hair follicles from hair-bearing scalp and transplants them to balding areas of the scalp. The transplanted hair follicles stay in place for several weeks before the hair shaft (the part you see on your head) sheds as part of the natural hair growth process. New hair growth will begin within three to four months. This method of hair transplantation is advantageous for several reasons. First, it’s minimally invasive; unlike other methods, it does not use require the use of scalpels, stitches or staples. As a result, there is no linear scarring, which is a concern with other hair transplantation systems. Patients feel little to no discomfort during treatment, and can resume normal activities a day after treatment. Results are natural-looking and long-lasting. NeoGraft is suitable for both men and women. Ideal candidates for NeoGraft are individuals with moderate hair loss and adequate donor hair at the back of their scalp. A member of our team will meet with you to determine your candidacy and discuss the results you can expect with NeoGraft. 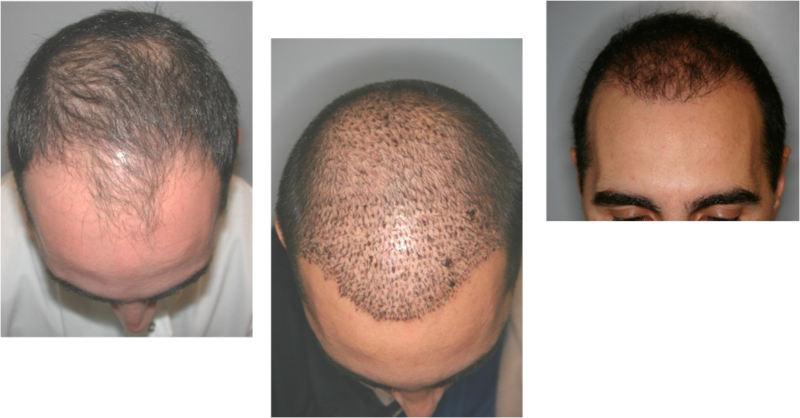 Hair transplantation with NeoGraft is safe and minimally invasive. The procedure can take anywhere between three and eight hours, depending on the number of grafts harvested from the hair-bearing scalp. Prior to treatment, the doctor will use a local anesthetic to numb the back of the scalp and area of implantation. You will feel little to no pain during treatment. Individual hairs are removed from the scalp in groupings of one to four follicles. Removing hair from the hair-bearing scalp does not affect future hair growth in this area because the area is genetically programmed to resist the hormone that causes hair loss. The hair follicles are carefully removed using pneumatic pressure to avoid damage. The donor hairs are then dissected so they are consistent in diameter and length; this improves the take rate of the follicles. The hair follicles are separated by size and transplanted to the implantation area of the scalp. New and full hair will begin to grow three to four months after implantation. Downtime is minimal; most patients are able to return to work the day after treatment. Strenuous activities should be avoided for the first week to avoid increased swelling. The hair grafts will be slightly raised for a week or two after the procedure, and will scab over within three to four days of the procedure. Sun and wind protection are important to protect the grafts as they heal. To find out if NeoGraft can help you regain a full head of natural-looking hair, schedule a consultation with The Plastic Surgery. Contact our practice by calling 916-929-1833 or emailing us today.